S’Mores are a classic American campfire tradition. Chocolate and marshmallow are wedged between Graham Cracker biscuits and held over the fire until melted and gooey. Sounds great and incorporating that concept into a pie is even better. This pie is rich so small slices are called for. 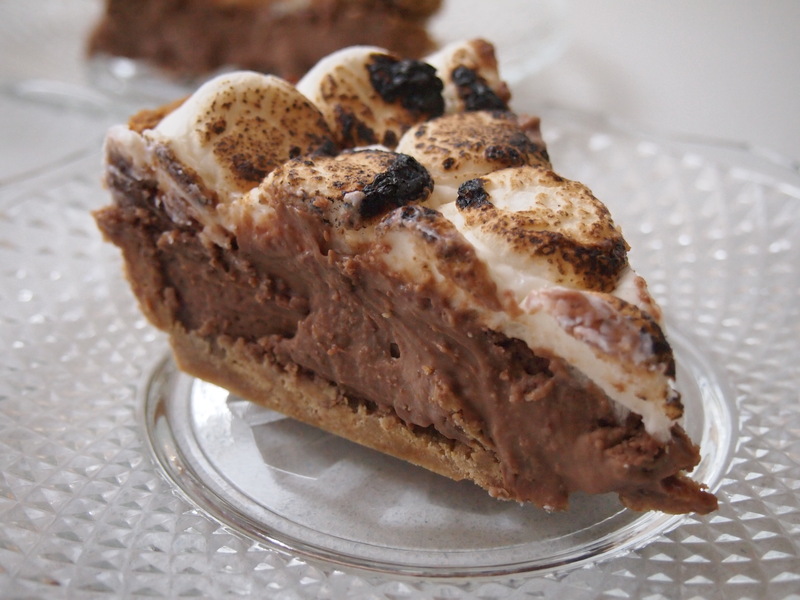 The best way to cut it is when it’s very cold and with a greased knife but once sliced the pie tastes best when heated up in the microwave for about 10 seconds – eating it cold doesn’t really capture the campfire s’more taste. Preheat oven to 160C. Mix biscuit crumbs and melted butter together until well combined and press into a 9 inch pie dish. Bake in the oven for 10 minutes and remove. For the filling, heat the cream and milk in a saucepan until just below simmering point. Take off the heat and add chocolate and stir until mixture is smooth and chocolate has melted. Slowly stir in the beaten eggs. Pour the mixture into the pie dish and bake for 30 – 35 minutes until the centre of the pie wiggles only slightly when moved. It might be best to keep checking it after 20 minutes but in my oven it took about 35 minutes. 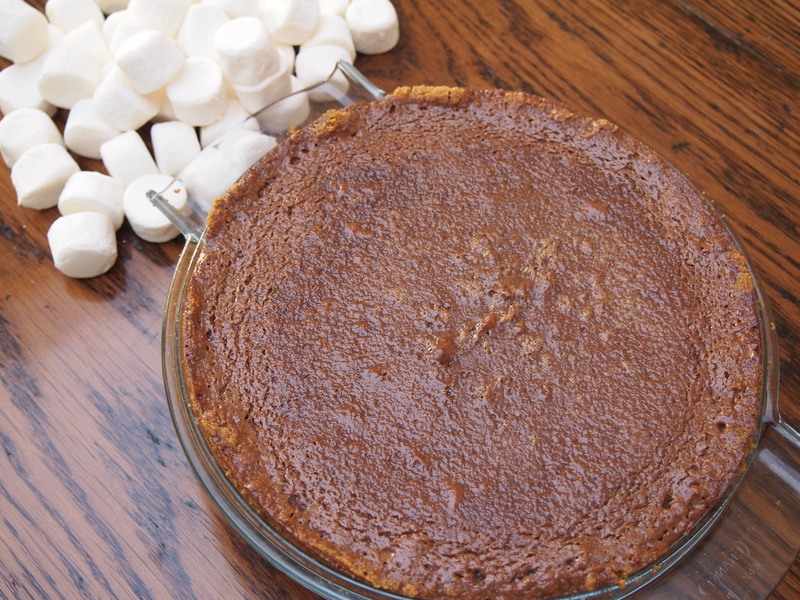 Remove the pie from the oven and allow it to cool for 10 minutes then top it with a single layer of marshmallows. 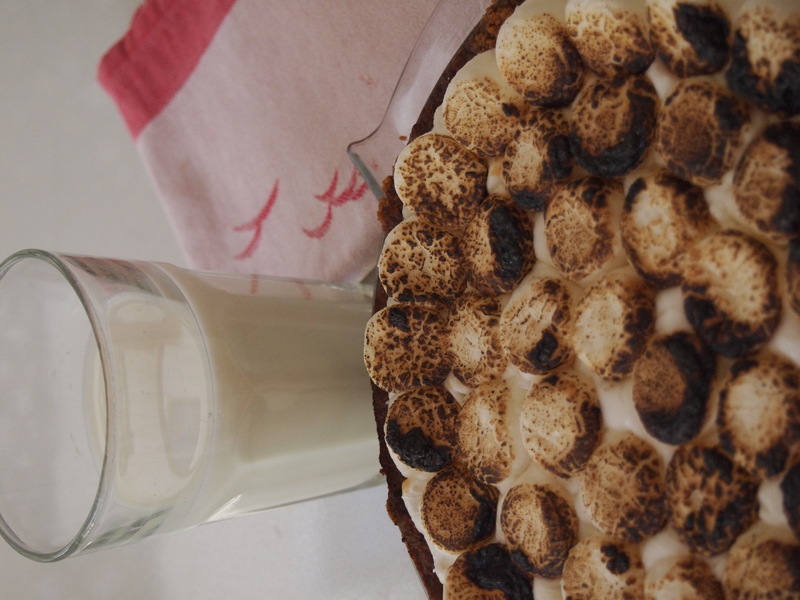 Using a kitchen blow torch carefully singe the marshmallows, it will only takes seconds and some of mine came out darker than I would have liked. Alternatively heat the grill in your oven to high and grill for a few minutes, again keeping a constant eye on it. Place the pie in the fridge to chill for 3-4 hours. To serve grease a sharp knife to slice and then heat in the microwave for about 10 seconds until just warm.